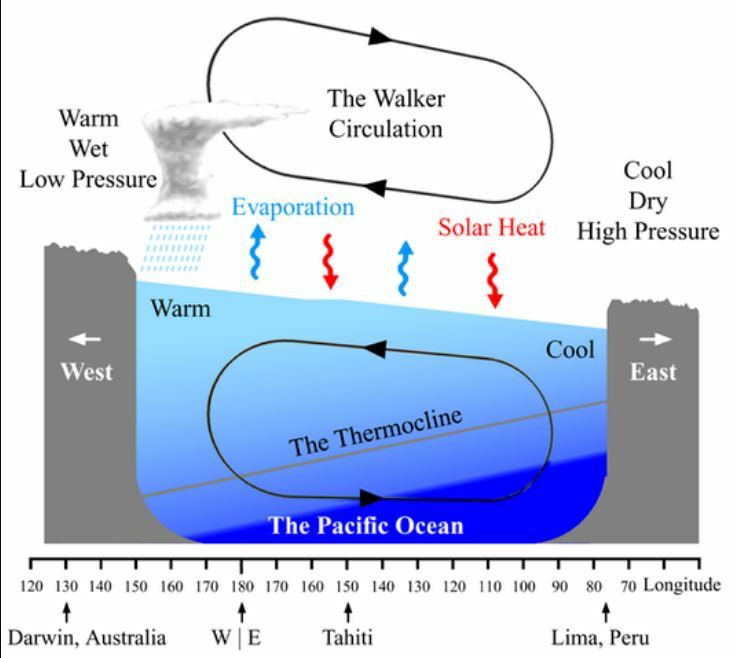 Driven by the east-west sea surface temperature difference across the equatorial Pacific, the Walker circulation is one of the key features of global atmospheric circulation. It is characterized by ascending motion over the Western Pacific and descending motion in the eastern equatorial Pacific. At the surface, trade winds blow from east to west, causing upwelling of cold water along the equator. From the early 1990s to about 2013, this circulation has intensified dramatically, cooling the eastern equatorial Pacific and triggering shifts in global winds and rainfall (see Figure 1). These conditions further contributed to drying in California, exacerbating mega-drought conditions and impacting agriculture, water resources and wildfires. Given these widespread impacts on ecosystems and society, the recent Walker circulation trends have become a subject of intense research. In contrast to the observed strengthening, the majority of climate computer models simulate a gradual weakening of the Walker Circulation when forced by increasing greenhouse gas concentrations (see Figure 1). “The discrepancy between climate model projections and observed trends has led to speculations about the fidelity of the current generation of climate models and their representation of tropical climate processes,” said Eui-Seok Chung, researcher from the Center for Climate Physics, Institute for Basic Science, South Korea, and lead author of the study. To determine whether the observed changes in the tropical atmospheric circulation are due to natural climate processes or caused by human-induced climate change, scientists from South Korea, the United States and Germany came together to conduct one of the most comprehensive big-data analyses of recent atmospheric trends to date. “Using satellite data, improved surface observations and a large ensemble of climate model simulations, our results demonstrate that natural variability, rather than anthropogenic effects, were responsible for the recent strengthening of the Walker circulation,” said Prof. Axel Timmermann, Director of the IBS Center for Climate Physics at Pusan National University and co-author of this study.